For your initial crop selection, it's best to grow a little of everything. That way, you can see how it goes, both in the growing and selling. Try to stick to the common and easily grown varieties. Divide your garden area into long- and short-season crops. Of course, you are going to have vertical as well as low-growing varieties. For the vertical ones, grow tomatoes and cucumbers. Leave melons and squash until later on. 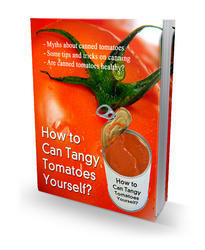 Get a mixture of early-, and late-season tomatoes. That will stretch out your harvest and give you small, medium, and large tomatoes tosell. Don't forget cherry tomatoes. They sell well, and most restaurants use a lot of them. Makesure you select disease-resistant plants. You don't want to fool around with something like a wilt disease, which could wipe you out in mid-season. For cucumbers, try some of the standard varieties as well as the burpless, Put in a few Chinese — those long, skinny ones. If your buyer is not familiar with them, point out that they're sweet, mild, free of seeds, easy to prepare, and the ideal size to serve sliced on a salad plate without having to cut them in half. 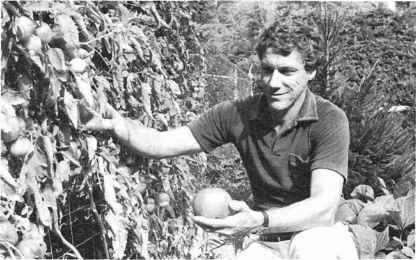 Hank Ellis proudly picks prizewinning tomatoes in his cash garden. Try several varieties of peppers. Grow only a few hot pepper plants. If your buyer doesn't want them, you might find a pizza parlor that would love fresh, homegrown, hot peppers. In fact, they might want to take all the peppers that you have. Don't go too heavily into the yellow or the banana types, or any other unusual shapes. Most buyers want standard green bell peppers. The same goes for eggplant. It might be very hard tosell the white, yellow, or brown varieties. You'll even find resistance to the long, skinny Chinese or ichiban varieties, but you might discover an Oriental restaurant that would love them. Bush or pole beans are good producers and store well after picking, but take time to harvest. A gourmet restaurant might like the tiny, half-size French beans. Such restaurants will pay extra for this size, but keep in mind that it takes a lot more of them to equal the same weight or volume of full-size beans. Consider peas in the spring and fall. They are big producers, take up very little space when grown vertically, and are fast growers. I would suggest that you stay with the sugar snap varieties, either the original six-foot Sugar Snap peas or the shorter bush varieties such as Sugar Ann, Sugar Mel, or Sugar Ray. You'll want at least three or four varieties of leaf lettuce. Don't bother with head lettuce. It takes a longtime to grow and needs a lot of water and special care. Besides, it is very fickle about the weather. Stay with leaf or bibb lettuce. There are many varieties that are quick and easy to grow, and they always bring a good price. Try a mixture of bibb or butterhead, and leaf. Although the red varieties of leaf lettuce are my favorite, I have found restaurant buyers are not as excited over the unusual or exotic. Stick with the green standard varieties like the Black-Seeded Simpson and Salad Bowl. The cos or romaine lettuce is also popular and sells very well. It has an upright head, is very easy to grow, and produces a lot of leaves. The other leaf crops such as Swiss chard, beet leaves, kale, and collards are not as much in demand, so even though they are easy togrow, I wouldn't put in too many plants. The most popular leaf crop is probably spinach, but it does well only in cool weather. Lettuce can be grown with shade and lots of water in the hot weather; spinach cannot. Root crops sell well, are easy to grow through the entire season. and are always in demand. Carrots, beets, radishes, and scallions are the main ones. There is a vast difference in growing time between carrots and radishes. Radishes, being a quick crop, require a lot more planting, harvesting, and replanting. The labor involved is repeated almost three times while you are growingjust one crop of carrots, and those carrots require virtually no work. They just sit there and grow, night and day. All you need is good, loose, friable soil and lots of water while they're growing. Scallions are different. They can be started with either seeds or sets. Seeds are cheaper, but sets produce a quicker crop. Realizing that it is the white, tender part, grown below the soil surface, that everyone eats, I got to thinking, "Why not plant the sets or seeds deeper than normal?" Then everything below ground would be white and you wouldn't have to hill up the scallions to get that white portion covered. Less work. After a few experiments, I came up with the perfect way to grow scallions, and a lot in one square foot. In addition, these scallions will have twice the amount of white, tender stalk as a regular scallion. For the best scallions, dig a hole this size, plant and cover 25 onion sets, and gradually add more soil as sprouts grow. For a small backyard garden, we dig out one square foot, straight down about six or eight inches, removing all the soil. (Your natural soil must be well drained to do this.) You thus create a square foot hole. Your soil won't cave in if it's fairly moist, and it should be in a square foot garden. Loosen the subsoil. Add a little organic matter and fertilizer to the bottom soil. Make sure you test and adjust your pH to between 6 and 7. Space out room for twenty-five sets. Do this by drawing two lines, making four squares in the square foot. Poke a hole in the exact center of the square foot, then, with two fingers at a time, poke twin holes four times along the lines, then two twin holes in each of the small squares. You now have twenty-five holes, and you can plant the sets. Push them in until their tips are just at the surface. Cover with about an inch of good soil mix, then water with a fine sprinkler can. In about a week you will have twenty-five green sprouts. Remember, your soil level is still four to six inches below the surrounding area. Now here's the best part of this new concept. Each week add just enough screened compost or special square foot garden soil mix to cover those sprouts. They will keep growing very rapidly, pushing up through the soil as you add it, and in a few weeks, by adding soil you will bring the surface up to the surrounding garden. You can start pulling the scallions any time you need them. They will keep growing, becoming fatter and taller. If you leave them too long they will develop bulbs on the bottom, trying to make a large, regular onion, but you will pull them long before that. Just think—you'll harvest twenty-five double-size scallions in just six weeks, from only one square foot. Restaurants use a lot of scallions, so plan on quite a few square feet for them. Of course, for a cash garden, you'll dig out and plant several square feet at a time. Can you charge twice the going price since yours are twice the size of the usual scallions? Talk this over with your buyer, but probably he will want to pay the same price. To a diner a scallion is a scallion, no matter what its size. How about corn? It takes up a lot of room, takes a long time to grow, and has a lot of pests. Besides, it yields the lowest profit for any vegetable. When I learned that farmers growing corn earn only $200 to $300 per acre, or about half a cent per square foot, I started thinking how a farmer could earn more from his land. 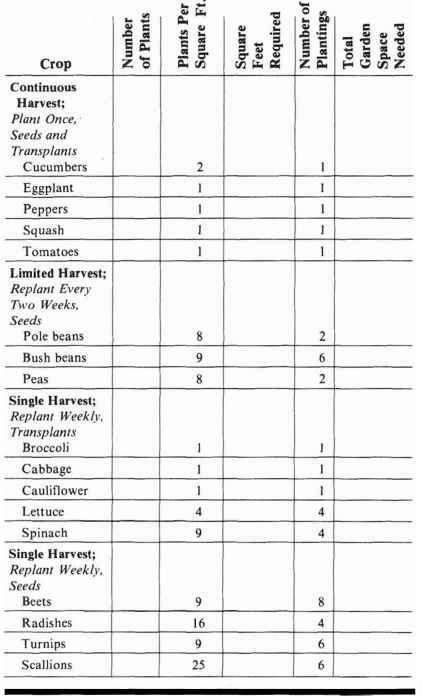 This led to a study of the smaller truck farm operations, which in turn led me to think about cash returns from a backyard garden. 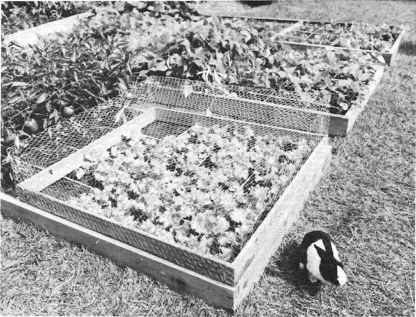 It is one thing to improve the productivity of a garden five-fold with the square foot system, but there had to be a new and different market for that harvest. Well, you know the rest of the story from chapter four. It can be done, and you, no matter where you live, can earn hundreds, if not thousands of dollars, from your hobby using this simple and practical system. Don't try to imitate the farmers in selecting your crops. Remember square foot is not only a totally different way to garden, it is a totally new way to market your produce, and you must always keep your market in mind when making your selections.